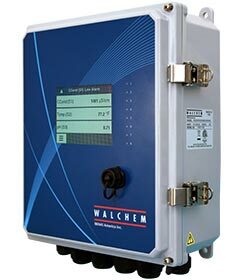 Walchem’s WCU410 Copper Controller and WNI Nickel Controller are optoelectronic on-line analyzers that measure the actual concentration of copper or nickel in solution. They are used in a variety of applications including electroless plating baths and microetch baths (including oxide-replacement types). Selectable between grams per liter (g/L) or ounces per gallon (oz/gal). Backlit digital display also acts as a bar graph for a continuous “visual summary” of measurement versus set point. 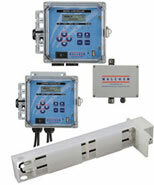 Concentration set point, alarm set points (high and low), dead band and pump on time are all easily adjustable. An interlock feature allows external devices (such as a flow switch ) to interlock control relays. Download stored data from the controller to a USB stick. Use the data to simply and easily validate system performance. The data and event logs show copper or nickel values, as well as accumulated chemical feed and relay activation times. 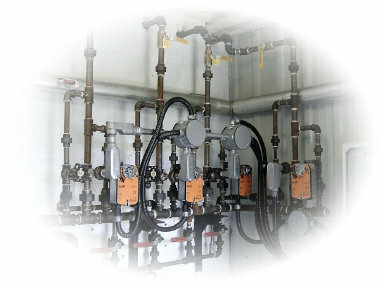 Four Separate Control Relays & Outputs (WCU )may be used to add copper, caustic, formaldehyde or chelator/stabilizer chemistries. Each output has a replenishment totalizer which may be set in units of time or volume. Optional pH Input Board (WNI) may be used to add pH adjustment chemistry. – Output has a replenishment totalizer which may be set in units of time or volume.